Fredericks & Freiser is pleased to announce “He Demon,” an exhibition of new paintings by Gary Panter. Widely recognized as one of the most influential figures of the Los Angeles punk aesthetic, Panter’s “punk, nuclear, hillbilly” sensibility has been a presence in the art world since the late 1970’s. In “He Demon” Panter replaces his typically manic compositions of archetypal figures and vibrant abstractions with scenes of psychological menace. 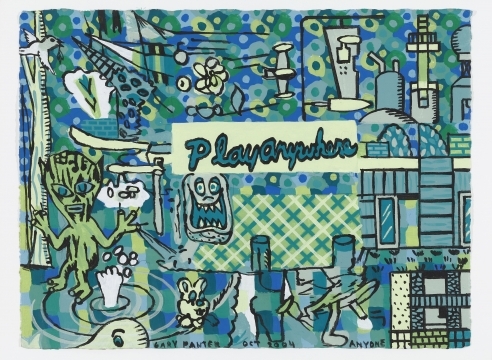 About the Artist: Gary Panter has been the subject of numerous solo exhibitions including the Aldrich Contemporary Art Museum, and Columbus College of Art And Design. He was included in Disparities and Deformations: Our Grotesque, The Fifth International Site Santa Fe Biennial curated by Robert Storr; Masters of the American Comics at the Museum of Contemporary Art, Los Angeles (traveling) and What Nerve! Alternative Figures in American Art 1960 to the Present curated by Dan Nadel at the Rhode Island School of Design Museum. He is the subject of a comprehensive monograph: Gary Panter (PictureBox), as well as the author of numerous graphic novels. This will be his fourth exhibition at Fredericks & Freiser. Fredericks & Freiser is located at 536 West 24th Street, New York, NY 10011. Our gallery hours are Tuesday through Saturday, 10am to 6pm. For more information, please contact us by phone (212) 633 6555 or email:info@fredericksfreisergallery.com, and visit us online atwww.fredericksfreisergallery.com.